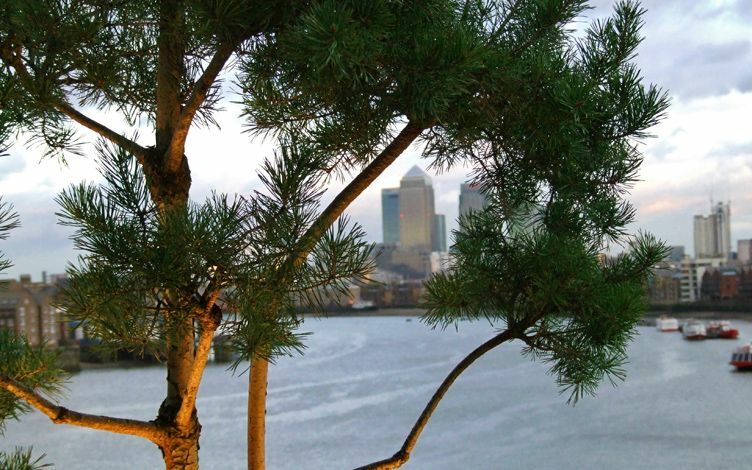 An angular Oak deck encapsulates this dynamic Canary Wharf vista, demarcated by an architectural Scots pine tree in a triangular planter. 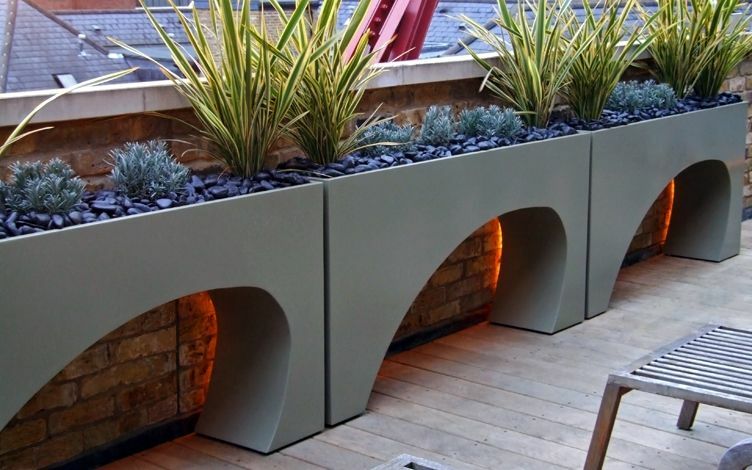 A curvilinear sandstone promenade provides a capacious riverfront platform to immerse in iconic city landscapes, enveloped by sinuous customised planters – enhancing an up-close Tower Bridge panorama. 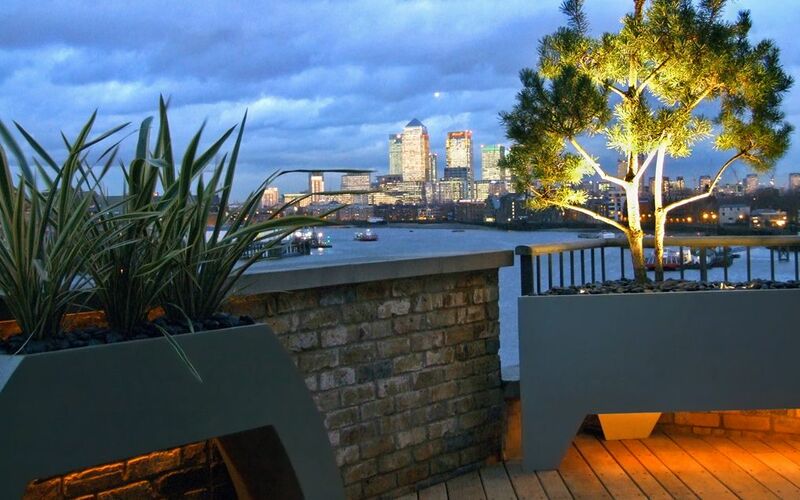 Backlit troughs highlight the London brick wall texture which defines this modern wharf conversion, and enfold three interconnected roof terraces, while encapsulating abundant River Thames essence. 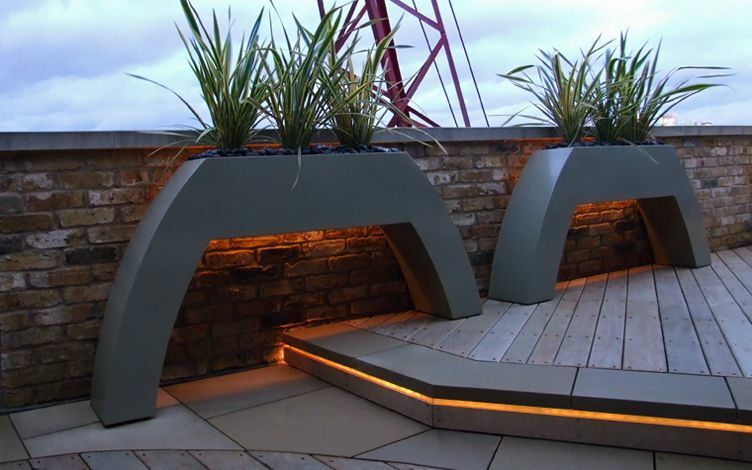 Positioned halfway between Tower Bridge and Canary Wharf, the front roof terrace features a panoramic elevation of illuminated city views. 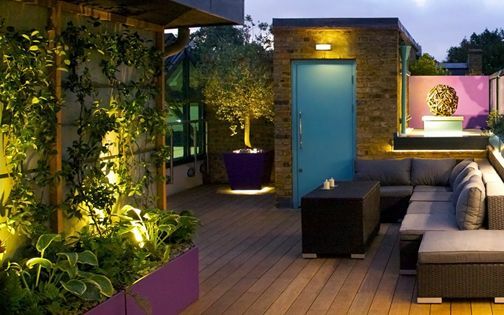 The client's contemporary art collection and love of natural materials inspired an instinctive project design process, where the apartment's hardwood flooring was continued into its terraces to enhance spatial fluidity. 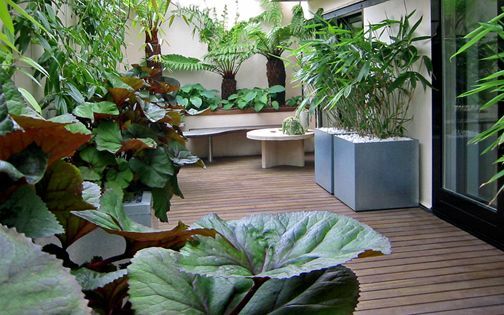 European Oak was custom-milled to complement the interior floorboards, detailed along a split-level decking design outside the living room. 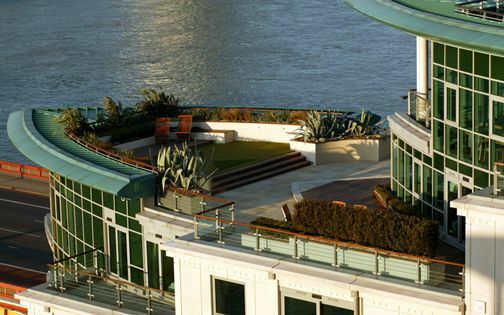 Across the upper deck, we utilised three varying board widths to create a dynamic contrasting sequence, where its angular pattern leads towards an expansive Canary Wharf vista. 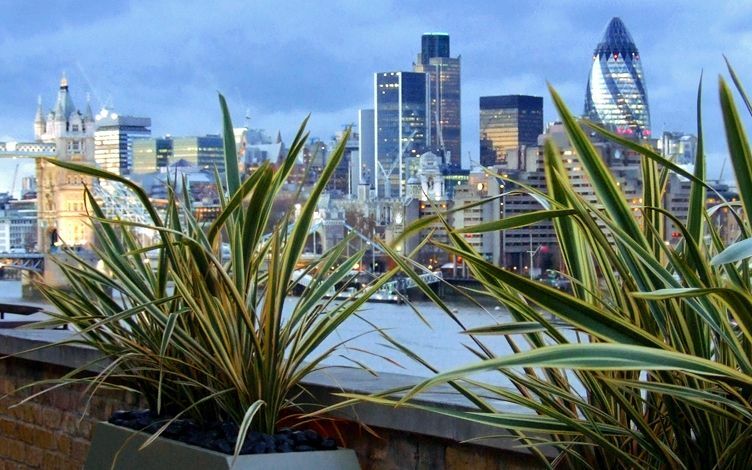 Designing river roof terraces along the Thames provides diverse settings to reciprocate with, amid London's evolving skyline. 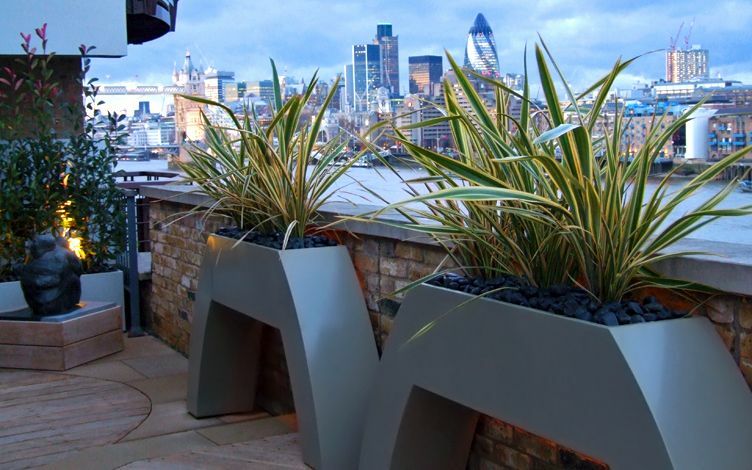 A pair of site-specific curved planters forms a central focal point, echoing the Gherkin's contours above their river landscape backdrop. 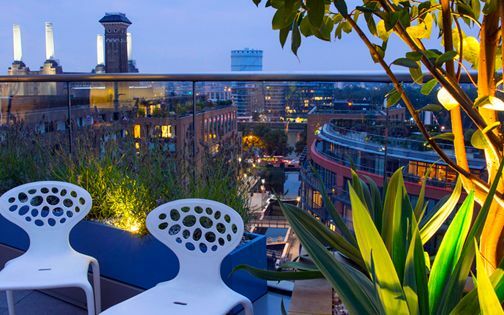 The decked layout integrates a fluid sandstone promenade which defines intimate vantage points to enjoy cityscape vistas, while a sculptural Scots pine silhouette frames Canary Wharf with radiant roof terrace lighting. 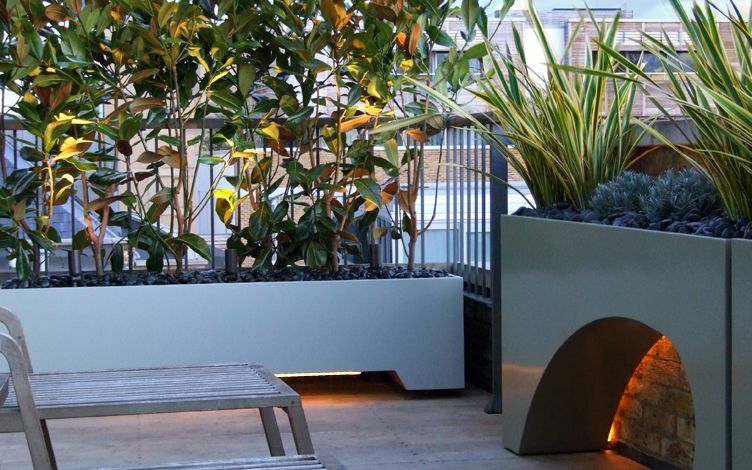 The slow-growing Pine cloud tree is evergreen and wind-resistant, planted asymmetrically within the triangular aperture of a bespoke planter – floating autonomously atop a spacious LED light recess. 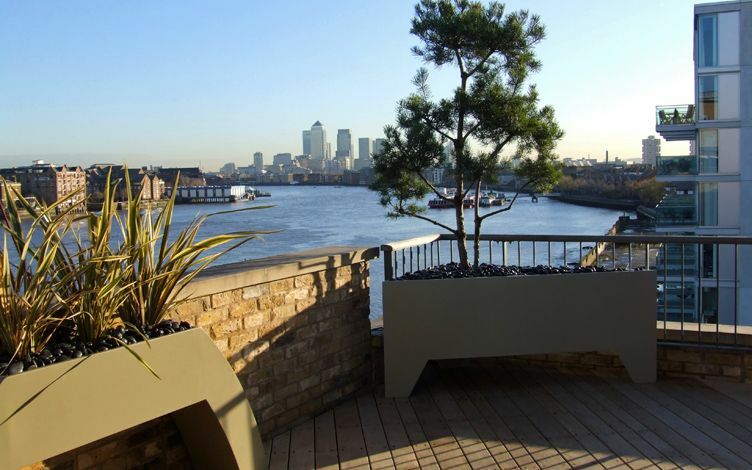 As in many converted wharf buildings along Shad Thames and its locale, the presence of water forms a pivotal element when designing urban terraces. 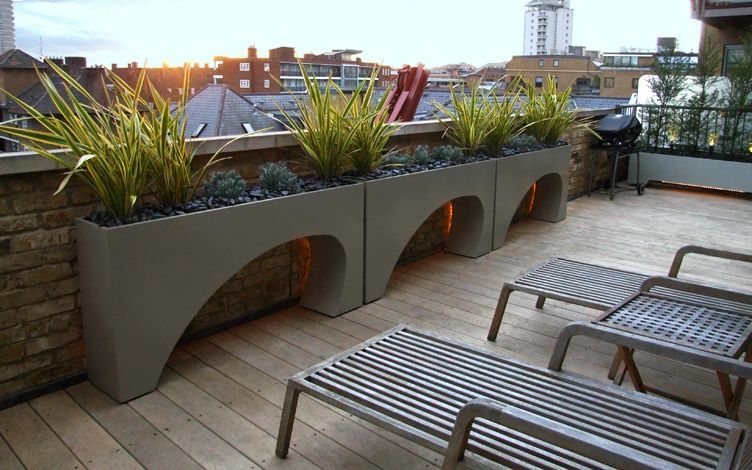 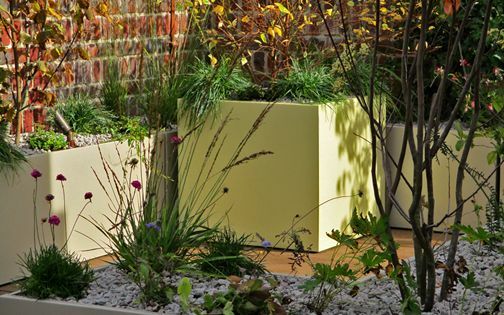 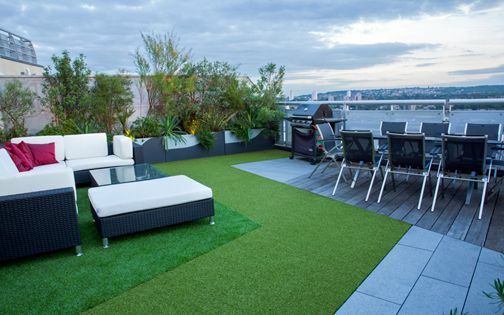 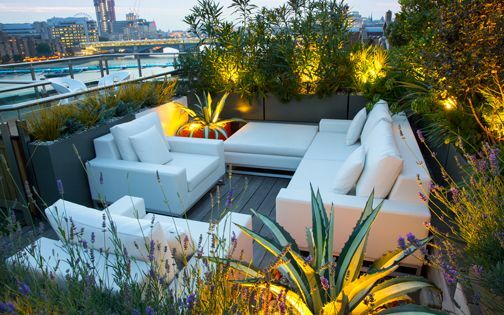 The south-facing roof terrace's wave-shaped planters introduce a water motif and a sense of place. 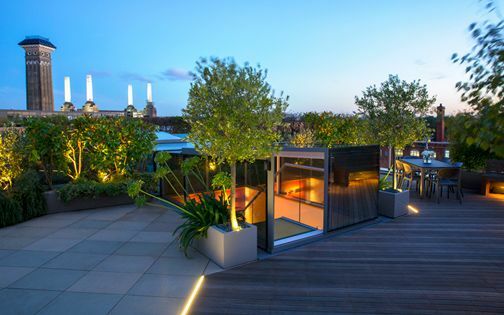 This one-off design is unique within a private rooftop zone adjacent to the master bedroom, enhancing its conserved wharf artefacts with minimalist outlines. 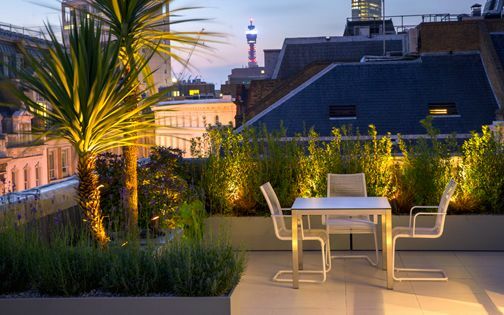 The site's London yellow stock brick walls provide a textured backdrop for sinuous, streamlined LED lights, where Ceanothus, European fan palm, Lavender and Southern magnolia soak up warm sunshine, conveying a Mediterranean landscape reminiscent of our client's Californian home. 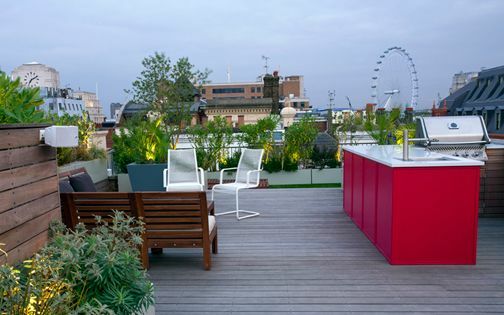 With copious architectonic silhouettes radiating from nearby city landmarks, we infused detail design sparingly to convey subtle visual interest within the roof terraces' layout. 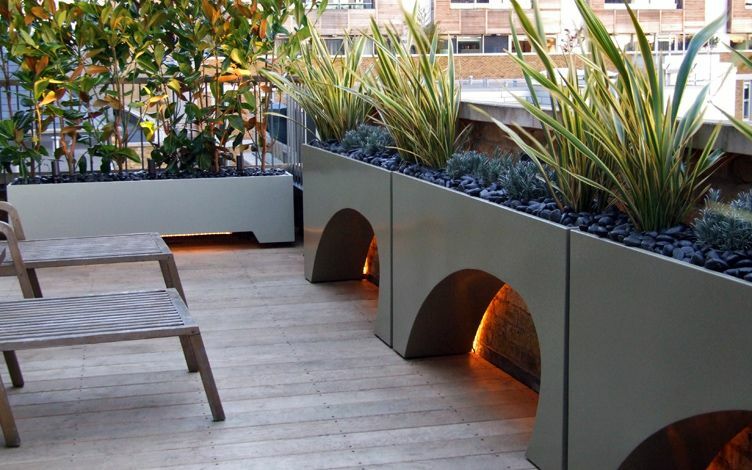 The fluidity of this approach is expressed by utilising contrasting architectural forms and textures, where polished black pebbles, smooth powder-coated containers and glossy foliage articulate a sculptural terrace design, while reflecting abundant light. 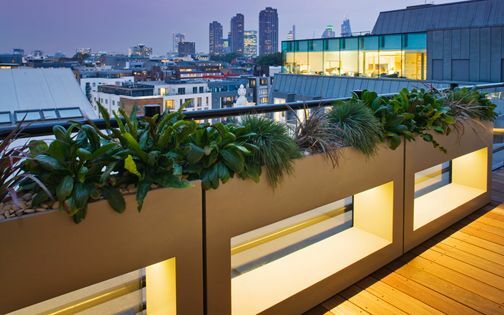 The split-level deck enables an extended platform to absorb its myriad of London landmarks, where a recessed step light reiterates the planters’ detail nuances – emitting a minimalist warm afterglow. 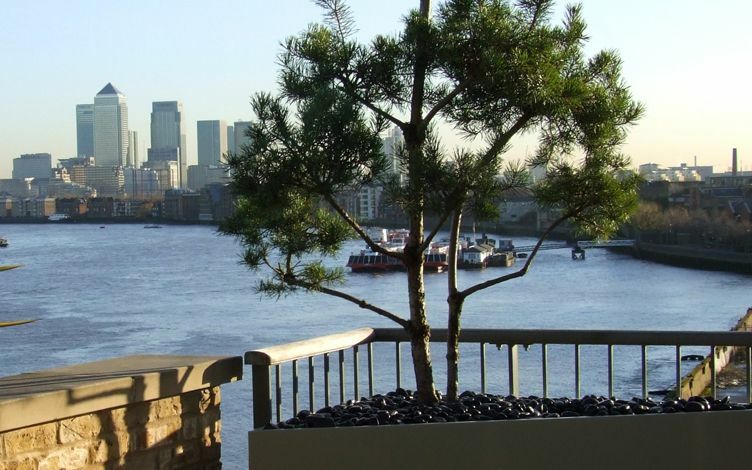 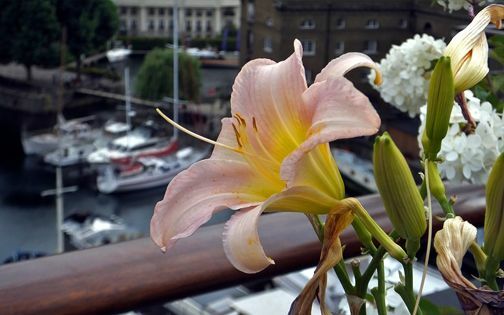 Inuit outdoor sculpture forms a personal portrayal of our client's travels, instilling further cultural context amid this intimate riverside wharf's cosmopolitan terrace landscape.